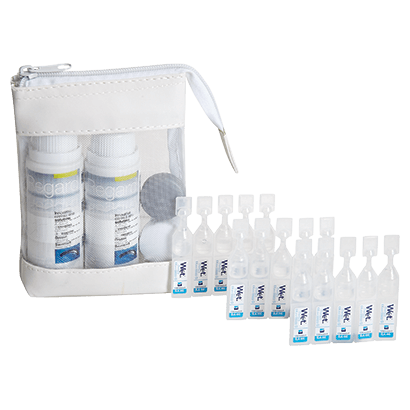 Pack size: 2 x 60ml solution bottles, 1 x 10ml eye drop bottle, 1 contact lens case & 1 travel zip bag. Great product! Just what I needed for my recent weekend break. Very impressed with the eye drops, I often suffer from dry eyes when I wear my lenses, especially after long hours of wear. When I put these in my eyes feel refreshed and ready to go! Regard travel pack Great travel pack, includes everything you need when you're going away - 2 bottles of solution, eye drops and contact lens case. Don't normally use this solution but am considering swapping to it as found I didn't suffer from cloudy lenses towards the end of the day, very impressed! The Regard Luxury Soft Lens Travel Bag is an ideal accessory for contact lens wearers embarking on a short haul flight. Created by Advanced Eyecare Research, the Regard brand is well known as an optimal source of comfort and technical precision for contact lens wearers. The luxury travel bag continues this line of confidence and style. The pack consists of two 60ml bottles of Regard contact lens cleaning solution, a bottle of eye drops and the lightweight case itself. The Regard Luxury Soft Lens Travel Bag is dedicated to convenient forms of lightweight travel. Doing away with the need to bring along a regular large size solution, the case is sensible way to travel. Each bottle can last around a week so the 2 bottles within the Regard Luxury Soft Lens Travel Bag can cover the duration of most holidays easily. The all-in-one solution is the first lens cleaning product to be completely preservative free. The manufacturers and developers believe this brings about a healthier and safer way to treat contact lenses and optical equipment. The unique chemical formula at work in the solution can make Regard Luxury Soft Lens Travel Bag an ideal travelling companion. Working on the assumption that a particle and impurity free lens is a healthy lens, the solution can get to work easily and thoroughly.